The central region :- The central region supports nearly half the park’s lion population as well as numbers of leopard,hyena and cheetah. Possibly the main reason for this is the quantity of sweet grasses and abundant browsing trees found in this area that support a large group of antelope, giraffe, buffalo, zebra and wildebeest. The northern region :- The Letaba and Olifants rivers contain as much as 60% of the Kruger park’s hippo population, and bird life here abounds. There are plenty of bushpig in the undergrowth of the Luvu vhu River and on most of the river banks you can hope to see sizeable herds of elephant buffalo,bushbuck,and Kudu concentrated near a water supply. 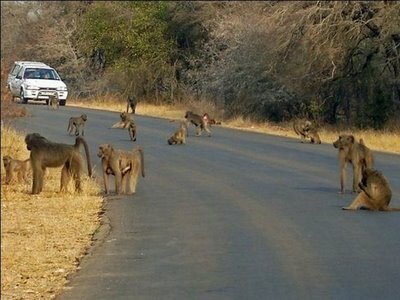 The far north region :-This is a rather fascinating part of the Kruger National Park. Sightings of rare birdlife and major areas of sand formed by river flood plains, combined with sandstone formations of the Mozambique coastal plain, make it attractive to visitors. A picnic site on the river bank provides hours of splendid bird viewing. The southern region :- The valleys are home to trees rarely found in other parts of the Kruger park, such as the Cape chestnut, coral tree and lavender fever-berry; and granite lies beneath most of the region, producing distinctive smoothed koppies at irregular intervals, which are typically surrounded by rock figs and form ideal locations for rock dassies or hyrax, baboon and klipspringer, not to mention the odd leopard. This is the region where you’re almost sure of seeing a white rhino as most of them occur here. Safari tours :- You can also enjoy Safari tours.Hence the Kruger National Park is one of South Africa`s premier tourist attractions. Safari tours are mostly common here.During safari you can view Big Five,Elephant,Lion,Rhino,Buffalo and Leopard.You should also see Zebras, Wildebeest,Bush pig,Impala,Giraffes and baboons which are all quite easily spotted. 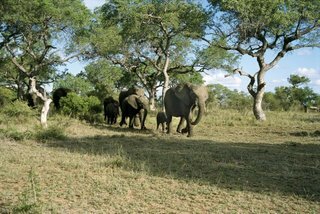 The best time to see game in the Kruger National Park is during the winter months of April to September.November and December are the calving months, this is a fantastic time for a safari. Water and Bush Birds in the Kruger :- There are over 600 species of water and bush birds in South Africa’s top reserve.Great egrets, reed cormorants and white-faced ducks are found by the water alongside giant kingfishers, grey and green-backed herons,plovers and black-winged stilts.You can spoteasily hornbills as well as eagles, hooded vultures and other birds of prey. Among the most colourful birds are Carmine bee eaters and lilac-breasted rollers. Bush walks :- It is one of the most incredible ways to learn about the fragility of the ecosystems of the Kruger Park and to see the smaller, animals and insects of the park like termites, spiders, snakes and plants. Bush walks can last up to four hours. Wilderness trails :- There are many trails offer in the Kruger National Park.Some of them are Metsi-Metsi, Napi, Massingir and the Sweni Wilderness. Wow, Kruger Park is so amazing. I love it there. Africa is amazing! what a nice place it is.